Vermont Abenaki Artist Association - Featured Artist Interview - Winter 2013Jim Taylor is a quillworker and wampum maker of the Elnu Abenaki Tribe. He was interviewed by Jessee Lawyer, who is begining his journey as a craftsperson and artist. Jim Taylor is a quillworker and wampum maker of the Elnu Abenaki Tribe. He was interviewed by Jessee Lawyer, who is begining his journey as a craftsperson and artist. (Q) A painter chooses acrylics, oil, or watercolor's to use on canvas, why have you chosen porcupine quills to create your artistic vision's onto leather? Porcupine quills fascinated me as well as how my ancestors with no modern tools prior to white contact, were able to make what are seen by some today as works of Art. Yet for their purpose they were Talismans with Dreams and beings sewn onto Braintanned Deer & Moose using mere quills to protect there owner. I try to continue that tradition of capturing a vision that either the person has told me they would like on their item, or let me use the vision I get when creating a bag for them. I have to believe the Ancestors would be proud to see the tradition continues. (Q)Wampum beads and pendants are very beautiful and take a great deal of patience and skill to produce, what inspired you to learn working with quahog and whelk shells. My people, the Elnu Abenaki tribe of Vermont recently gained State Recognition after years of fighting with both State & Federal officials on April 21st 2011. As part of our Recognition process we needed to draft a Tribal Constitution, I was asked by our Tribal Chief Roger Longtoe Sheehan to Draft our Tribal Constitution in two ways. The first was to be written to satisfy the State & Federal Governments the second was to be “Written” in strands of Wampum beads to satisfy our people moving forward, to have a Traditional document recorded with the use of Wampum as our ancestors before us had done from the time of its arrival here in the North East from our South Eastern Brothers & Sisters the Shinnecocks, Pequots, Narragansett & the Wampanoags. Wampum for us is a living and breathing item, it was woven into belts to communicate Stories, Events, and Alliances all of this to keep them alive, for the future 7 generations. These Belts and strands of Wampum may seem mere objects of a primitive art form but to North Eastern Native People they are to be taken care of much like we take care of our young children. The Elnu people still hold onto and continue these traditions that are sacred to us and why Chief Roger Longtoe tasked me to make the wampum beads to record our Tribal Constitution, each strand was painstakingly made by me from shells selected for the best purple as well as the white beads from the Whelk. They represent for our people who we are and how we wish to be governed as a Tribe. So in closing, Wampum’s value is looked at by my people the Elnu Abenaki as REBIRTH, rebirth of our history, rebirth of our culture, and for the next Seven Generations to come.This will be my gift and legacy to my people as well as my Family. (Q) It takes several steps to create art from a vision, to planning, to producing often connecting with a piece and projecting a bit of yourself into it. What feelings or emotions do you want to envoke in the Abenaki and non-indigenous communities. I have recently been working on Projects for other Native people as well as for myself, for the early years of my quillwork it was more about making money at it, but as I grew as an Artist I began to pull back a bit and began to work more on projects that for me were more rewarding. Each item that I am asked to do, I try to tap into what connects them to their people as well as mine. I was asked by a close Aquinnah Wampanoag Tribal Member to make her a bag, I began her project with a design that I believed was right for her & me. When I began to quill the bag I was just not getting the energy from the piece that I wanted, I put it away only to pick it back up and the week I did my Okemisis (Aunt) who I was very close with crossed over leaving a huge void and I put away the bag. When I felt I was ready to work on it again 9 months later, my Nigawes (Mother) my Okemisis baby sister crossed over. I chose after I felt at peace that I would redo the design & layout of her bag and everything began to "Click" I was excited by the design and the more I worked on the bag they better I felt. 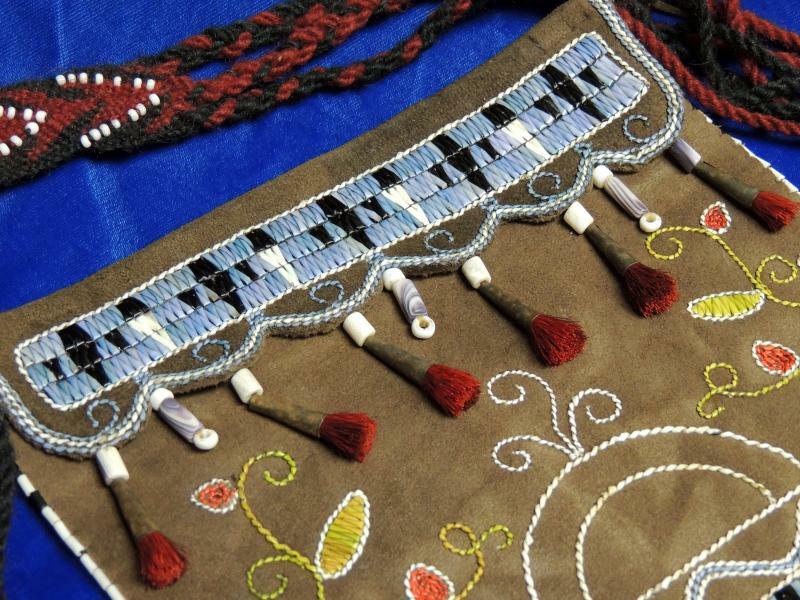 This particular bag captured elements & colors that I felt would make the owner more connected to her people as well as leaving a piece of me that would be recognized by my people on the bag as well as her. She was extremely happy with the outcome and the design, as was I hearing her reaction when she received her bag. That for me as a Quillworker/Artist is what keeps me connected to my Ancestors and to other Native people in the Native Community as a whole. (Q) Abenaki art is not the go-to image when one thinks about indigenous arts of the Americas. how does it feel as an Abenaki to have your underwater panther bag in the American Museum of Natural History? It was Awesome to say the least. I was somewhat taken aback when out of the blue I receive an email from the Museum saying " Would you be Interested in quilling and Eastern Style Great Lakes Underwater Panther bag to replace one that was on loan from the Canadian Museum of Civilization I was hell yea I would !. They had Googled "Underwater Panther quillwork" in an Image search and a couple of bags I had previously made came up and from there they found my web page and they reached out to me.They left the design elements up to me so based on my vast research and knowledge of the originals I was able to come up with a bag with elements that represented the Underwater Panther and where it resides in our world as Native People here in the North. The Museum was very pleased with the bag and my work and that made me feel great, as well as knowing one day my Grandchildren will see that bag & know that they're Mahom (Grandfather) made it and for me I take great pride knowing that. (Q) As an artist beginning his journey i try to learn as much as i can and draw inspiration from those who have been creating for many years. For the young Abenaki artists and crafts people what advice can you give us? I was Inspired by my ancestors before me & derive alot inspiration from them as well, especially when it comes to my quillwork. I can't say this enough when I first started doing quillwork it was not what you see today, there was alot of hair-pulling but I pushed through it !. Never give up! the Creator gives each one of us a gift(s) and at some point he reveals it to us, mine is Art which has been a big part of my life & current career as a Graphic Designer. Quillwork and wampum are my Native Art, when you receive that gift albeit a craft or whatever, never get discouraged your Ancestors walk with you always and they are always there and will guide you along your path. Also that gift must never be jealousy guarded, it must be shared so that others may learn from you, teach, share, this is what the Creator wants us to do so that as a people these traditions crafts and legacies will continue and the Abenaki People and the future 7 Generations will forever be.